When it comes to stewardship of the seas, we've been greedy, irresponsible, and just plain stupid. We take too many fish, wreck habitats in the process, and feign ignorance when it suits us. Really, we could use a few old-fashioned whacks on the bottom from Sister Nature. But being human, we don't like being lectured to or ordered around. This is why Becky Selengut, the author of Good Fish: Sustainable Seafood Recipes from the Pacific Coast, is the right messenger for our sadly diminished times. Becky (who happens to be a friend) is a chef and seafood lover. She's also a compassionate writer with a wicked sense of humor. Becky's not going to go all earnest on us, like so many otherwise well-meaning greenies. When I was just a wee lass, I had a thing bad for shrimp cocktail. I remember how cold and frosty that glass was; how the ice cupped a thimbleful of cocktail sauce in the middle; how five plump shrimp fanned out from the center like the orange-pink petals of a rare flower... I feel wistful about those cheap and easy shrimp cocktails, those family meals that seemed to be devoid of the modern conversations about food that are fairly commonplace today. Being an ethical eater sometimes gives me an adult-size headache. Becky feels our pain—the pain that comes with knowledge, responsibility, and doing the right thing (not to mention the pain of being reprimanded). I fondly remember those shrimp cocktails, too. They were a treat. But no more. As Becky goes on to say, there is also pleasure in being informed and eating seasonally. Those shrimp cocktails were special, but a sustainably harvested spot shrimp pulled from the depths of Puget Sound and savored the very same day is even more special. 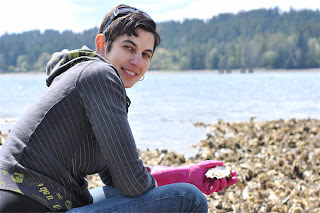 Becky is a knowledgeable guide in all things briny. She peddled crab-stuffed flounder rolls as a kid in New Jersey, went to culinary school, then put her degree to work in a number of Northwest eateries before becoming the "fish girl" at the famed Herbfarm Restaurant. Now she's a chef for hire, freelance writer, and teaches cooking classes. Good Fish is her paean to what remains of the Pacific fishery. 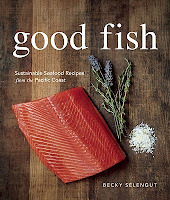 While it's mostly a cook book, with mouth-watering dishes for sustainable species, it also shows off Becky's wit and wisdom in the head notes and marginalia that accompany each chapter and recipe. To wit: It wasn't until years later that I realized sablefish and black cod are the same thing. In fact, I do believe I've said at a cocktail party or two that my two favorite fish were sablefish and black cod. At least I'm consistent. Or this: Arctic char is the smart, well-dressed girl in the corner of the room who's quiet and subtle and doesn't hit you over the head with her confidence, yet everyone in the room (especially her) knows she's got it all going on. So true. I can personally attest to Becky's badinage (and occasional bawdiness); I took her clam-digging and spent the afternoon between fits of laughter and perma-blush. Back to the message. If you want to be a responsible steward of the sea, it's time to consider dog salmon and sardines for the table. Gone are the days of blue fin tuna, Chilean sea bass (aka Patagonia toothfish), and whatever variety of shrimp the supermarket happens to carry. We need to be conscious of the seafood choices we make. 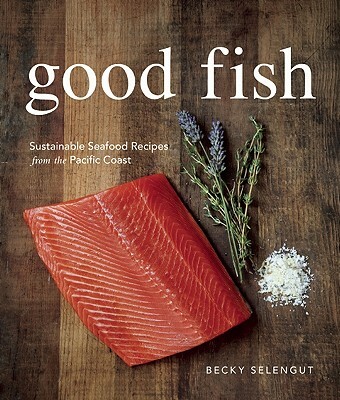 I like to think I know a few things about Pacific fish, but I'm always learning from Becky, even on familiar subjects. For instance, in her salmon chapter, she gives some buying tips that includes this useful nugget: "Look carefully at the pin bones. If you see a divot around the pin bones, it's a sign that the fillet is old." The images depicting fish fillets (salmon and halibut) that are undercooked, just right, and overcooked will be cherished by inexperienced home cooks looking for just the right flake factor. A few of the recipes in the book I've been lucky enough to be served by the author herself, such as Jet's Oyster Succotash, while others I just had to try. The Geoduck Crudo is light and balanced, without stepping on the big clam's...err...neck. Scallops with Carrot Cream and Marjoram—delicate, sweet, and briny—did indeed "blow this dish right out of the water." Others are on my to-do list: Mussels with Guinness Cream; Halibut Coconut Curry with Charred Chiles and Lime; and Dungeness Crab Mac-and-Cheese. I agree, it is important to look after the earth's resources. We owe it to our children.